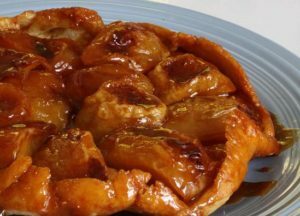 Tarte Tatin is a traditional French dessert usually made from apples caramelized in butter and sugar then baked with a pastry dough on top. It is then inverted into a platter before serving, much like an upside-down cake. This particular recipe uses store-bought puff pastry making this dessert truly a time saver. The apples are also cooked in the microwave oven to further cut on cooking time. Here is an easy dessert recipe for Tarte Tatin. Place apples in 9-inch glass pie plate; cover with waxed paper, and cook in microwave on High 7 minutes. Using a heavy 10-inch skillet with oven-safe handle, melt butter over medium-high heat. Add sugar and cook about 5 minutes or until amber in color, swirling skillet frequently. Remove skillet from heat as soon as caramel turns amber. Residual heat from the skillet will continue cooking the sugar. Keeping the heat can burn the sugar and lead to bitter taste. Using a pair of tongs, transfer apples from pie plate to skillet, coating flat sides of apples first with caramelized sugar. Then arrange apples, rounded side down, rotating them slightly to fit in a single layer in skillet. On lightly floured surface, unfold puff pastry sheet. Fold in each corner of puff pastry about 2 inches and press down to form an "octagon." With lightly floured rolling pin, roll dough into 12-inch round. Place dough round on top of apples in skillet; tuck in edge of dough around apples. With knife, cut six 1/4-inch slits in dough to allow steam to escape during baking. Bake tart for about 25 minutes or until crust is golden. When tart is done, cool in skillet on wire rack 10 minutes. Center large platter upside down on top of skillet. Wearing oven mitts to protect your hands, and grasping platter and skillet firmly together, quickly invert tart onto platter. Serve a slice of warm Tarte Tatin with a scoop of vanilla ice cream if desired. *Other fruits such as pears, peaches and pineapple, can be used as alternative to apples.